Continuing upstream along the Saone we soon arrive at the Viaduc la Quarantaine (also called the Pont Ferroviaire Kitchener). It's a rigid steel railroad structure consisting of one full arch span across the channel and half arches for the side spans. The main span is supported on big steel rocker bearings with smaller bearings supporting the half spans at the abutment seats (see photo below). 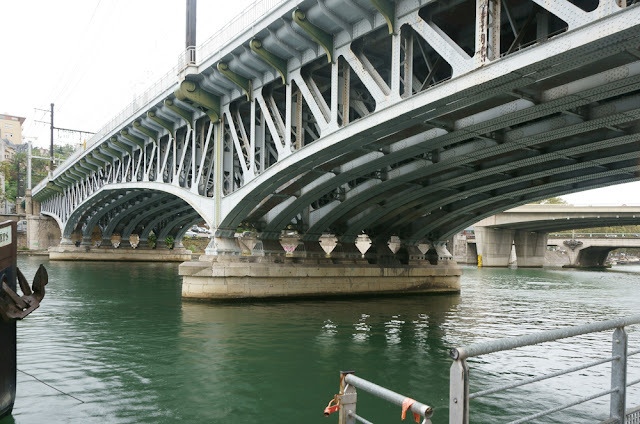 If I'm translating the French on the Lyon Bridge Blog correctly it seems the city felt the previous bridge was an eyesore and ordered this replacement structure, which was completed in 1932. Although most bridges had Art Deco details in the 1930s, this bridge seems to have been influenced by 'Orientalism' with curlicues supporting the deck overhang and with a pointed arch. This bridge carries the French National Railway (SNCF) trains to and from the previously studied Mulatiere Railway Bridge and the Perrache Viaduct. I count at least four sets of tracks on the deck although it's hard to tell because there are so many switches on the bridge. 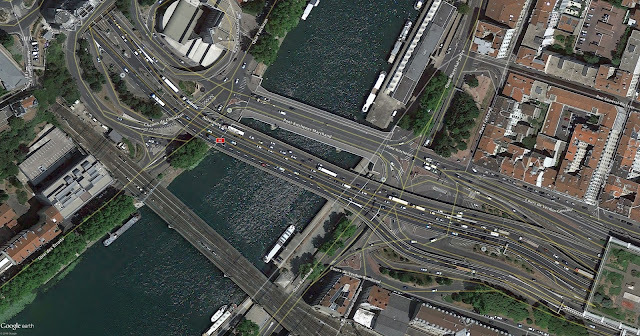 At this location the Saone is a narrower river with shorter river crossings (maybe 450 ft). The Viaduc Quarantine has seven arch ribs. It was built by Allary Freres and Fives-Lille according to the Structurae Website. I couldn't find much on Allary Freres but Fives-Lille (renamed Fives-Lille Cail) has over 20 bridges they constructed listed on the Structure Website. The Viaduc Quarantaine is in good shape and its an attractive bridge. I'm not sure why it's called 'Quarantaine,' which means quarantine in English. Maybe this area was quarantined at some point?